Or Yehuda (meaning light of Juda, after Yehuda Elkalai of Sarajevo, one of the fathers of Religious Zionism in the 19th Century) is situated between Tel-aviv and Ben Gurion Int'l Airport. 28,000 inh., founded 1949. Or Yehuda is covered with flags. The unofficial municipal flag is a horizontal wavy triband, light blue-white-orange with emblem in orange, white and green on the center of the upper two stripes. Inscription in white over green on the bottom stripe. 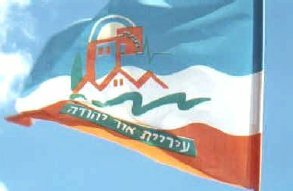 The municipal emblem was published in the official gazette (Rashumot, Yalkut ha-Pirsumim), YP 1382, 3 August 1967, for the then Local Council Or Yehuda, replacing a previous one (YP 633, 13 November 1958) however the municipal webpage shown a different emblem altogether. Or Yehuda became a municipality in 1988. Sources: author's own observation, 29 September 2001.